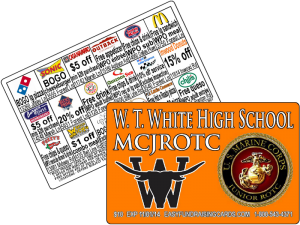 Why should you consider fundraising discount cards for your group or organization’s next fundraiser? Simple – because there is simply nothing better. Sure, there are all kinds of things you can do to raise money when your group is in need like banquets, candy/jerky sales, catalog promotions, bake sales, 5K runs, auctions, raffles, pancake breakfasts, the list goes on and on. However, most of these things require a substantial amount of preparation and work, which you don’t find with fundraising discount cards. Day to day life is stressful and busy enough as it is. We rise early in the morning and rush off to work, leave work to hustle the kids back and forth from one practice or ball game to the next, then get home just barely in time to eat a bite, shower, get in bed and start all over again. Who has extra time to plan and prepare, then work hard as the dickens to raise money? With fundraising discount cards, you’ll find that your group can raise an incredible amount of money with hardly an effort when compared with other popular and common methods used to raise funds. Why is it so much easier than other products your organization has promoted, or activities your group has participate in to raise money? Simple. It’s a valuable product that consumers need today, so it virtually sells itself. This is a time when people want to save every dime they can; in fact, many people NEED to save money, as they can hardly make ends meet with the lack of jobs, cut hours and other economic issues. With these money-saving cards, those who purchase enjoy substantial savings and discounts on food, hair cuts, fitness, car maintenance, things that are for the most part essential. And they enjoy the savings for an entire year, simply by making a one-time purchase of a $10 card! Let’s face it. When the economy is down, unusual weather conditions such as hurricanes have left tens of thousands without homes or jobs, a candy bar or cookie dough is the last thing on anyone’s mind – but everyone has to eat, and everyone needs their hair trimmed on occasion. Now more than ever before, fundraising discount cards are a welcome change from those things that have been the “norm” for decades. People are unemployed, can barely pay the electricity bill, and do not want catalogs or jerky being pushed in their faces. Yes, it’s definitely difficult for school and church groups, sports teams and other non-profit organizations to collect the funds they desperately need when times are bad and individuals/organizations who normally donate simply do not have the money. However, fundraising discount cards can save the day, as they’re super profitable, practically sell themselves due to the perceived need and value of the customer, and require very little work on your group’s behalf. Simply order the cards and begin selling when they arrive – which brings us to another point. You can sell these cards anywhere and everywhere because of their easy portability. Just tuck a few away in your wallet, purse or pocket and you’re ready to roll. Now you can clearly see what there’s simply nothing better than fundraising discount cards. Why consider anything else?